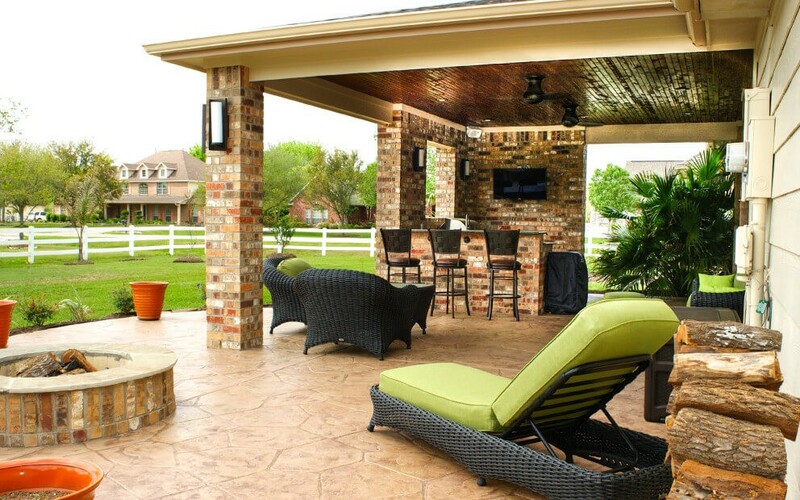 At Texas Custom Patios, we design patio covers that are both functional and beautiful. We use only wood frame construction - the same type of construction used on your home. The design of your patio cover mirrors your home’s original style, so it blends seamlessly and beautifully with your landscaping and exterior. We match the design, stone, wood, and other finishes to both your external design and your personal preferences. We serve the Houston and Dallas – Fort Worth areas. If you have questions about patio covers, please call (281) 265-1994 in Houston or (972) 915-2727 in Dallas. A gorgeous outdoor living space was created for this home – a place that would allow their entire extended family to spend time together. This home had a small covered patio and the homeowner wanted to create a new space that included an outdoor kitchen and living room complete with a fireplace that would complement the new pool they were having built. 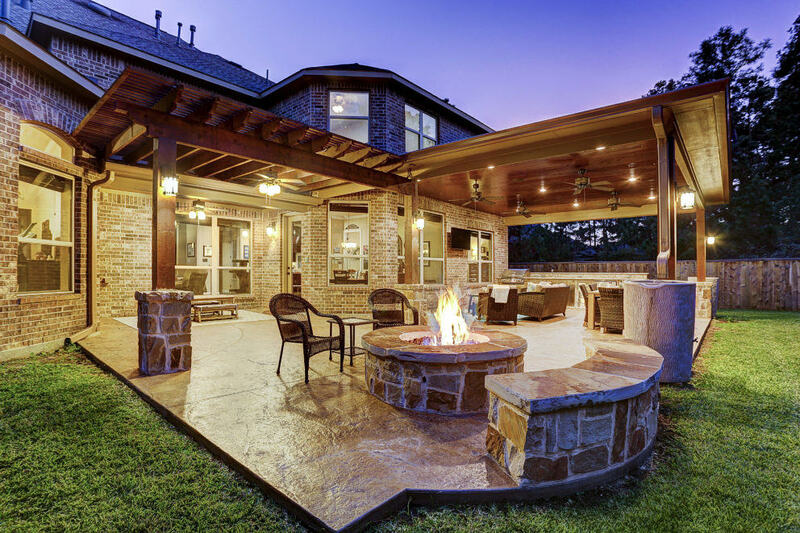 Texas Custom Patios will provide you with a rendered view and specifications with our proposal for your Houston or DFW patio cover after you have met with your project developer to develop your plan of action. This home needed an updated look in the backyard. This project was a challenge to build — not wanting to remove any trees but wanting a covered area with a kitchen and fire place as well as a pergola with both a water and fire feature. The main objective of this project was to create an extension of the home for the family that would include an area of full view to the pool, an outdoor kitchen, a fire feature, and space for relaxing and dining. A freestanding outdoor retreat was what this homeowner desired…the ability to keep their yard full of trees and have a great outdoor living space. Great addition to an existing patio cover to create an outdoor living room complete with a summer kitchen and dining area. This older home got a great face lift with the addition of an outdoor living room. This outdoor living space was built so the customer would have enough room to enjoy their backyard. 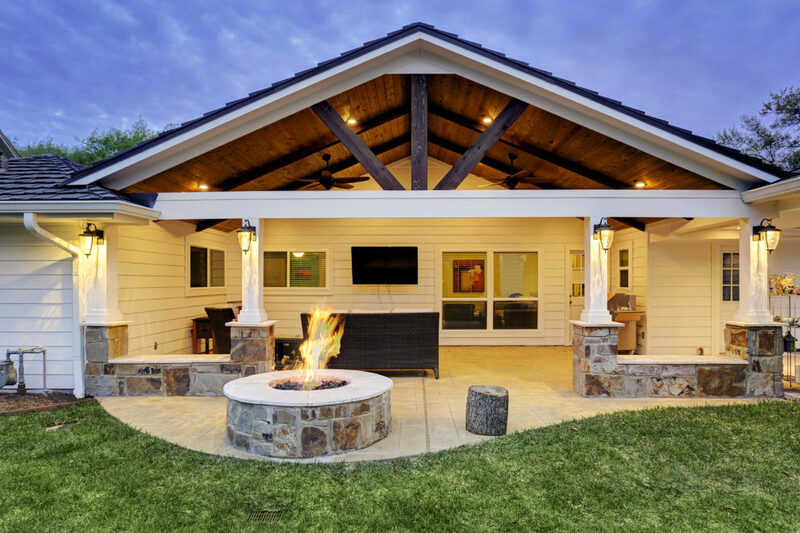 This freestanding covered patio with an outdoor kitchen and fireplace is the perfect retreat from the constraints of the house. This homeowner wanted something that would give them full shade that tied in seamlessly with their home. A cozy space was created off to the side of the home to give the homeowners a space to enjoy their pool and backyard. The original space of this home was a wooden deck that didn’t give the homeowner the space they desired to relax comfortably by their pool. This homeowner wanted an extended outdoor living area in order to create their own personal retreat. This older home needed a face-lift in the backyard. This homeowner wanted to extend their small patio cover that was built with the home and add an outdoor kitchen. This large outdoor entertainment space was exactly what the homeowner desired to complement their new swimming pool. A beautiful renovation for this backyard gave the homeowner the outdoor living area they desired. This home had an existing pergola that was outdated and not what they desired. This homeowner wanted to extend their existing patio cover as much as possible in order to have more shade in their backyard by the pool. A backyard face lift for a an older home in Houston turned this homeowner’s backyard into the retreat they had been wanting. This spacious outdoor living room was added to allow for the homeowner to have the perfect patio to complement the home. 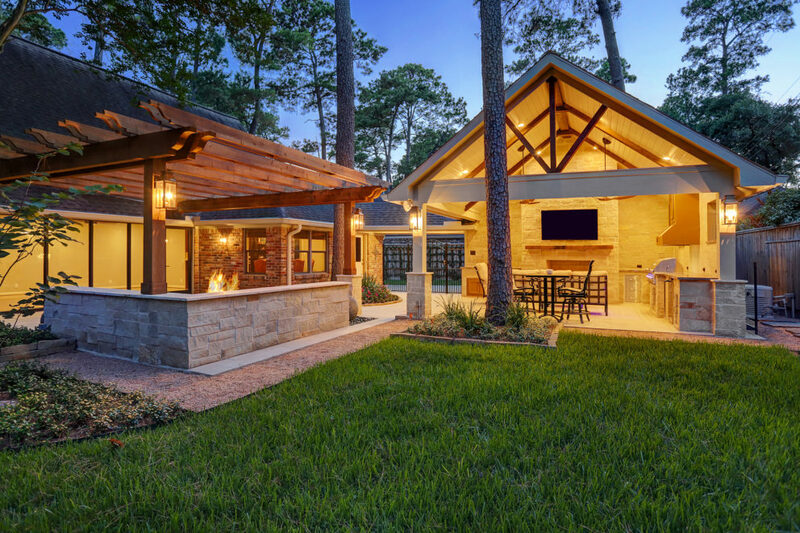 This traditional hill country outdoor living room is a great addition to this home – giving the homeowner a space where they could relax and entertain. This patio cover was a challenge for us because of the limited back yard space, but we were able to create an open air living space that complemented the homes original architecture. A spacious modern outdoor living room with a lower level patio and outdoor kitchen was added to this Bellaire home. 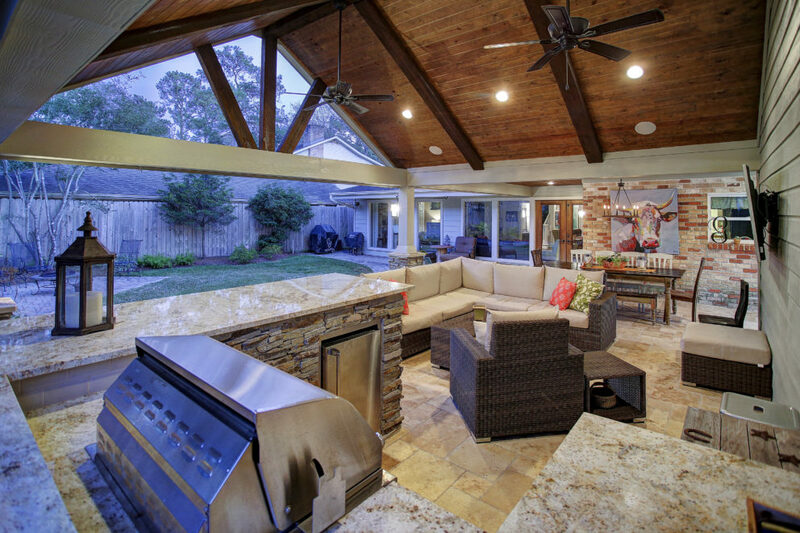 This great Memorial area outdoor living space is the perfect place to hang out and enjoy family and friends. 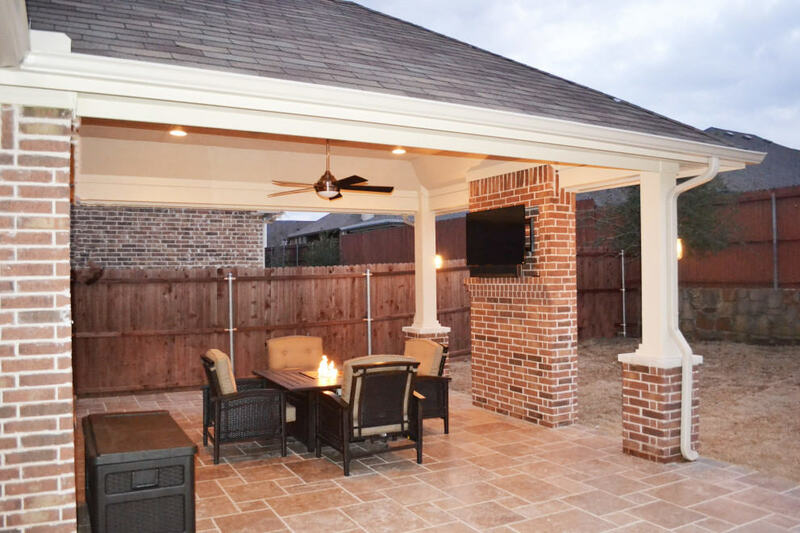 This beautiful outdoor living space is in the heart of the Memorial area in Houston. Backing up to a lovely green space and Buffalo Bayou, this home only had a paver patio that was in disrepair, and no shade to enjoy the beautiful views. This homeowner wanted to create a space for both an upper and lower living space. Designing/building this outdoor living area was a challenge. This project was designed to allow the homeowner to have their outdoor living space as a part of their daily life all year round. A simple, yet fun outdoor living area was created for this homeowner. 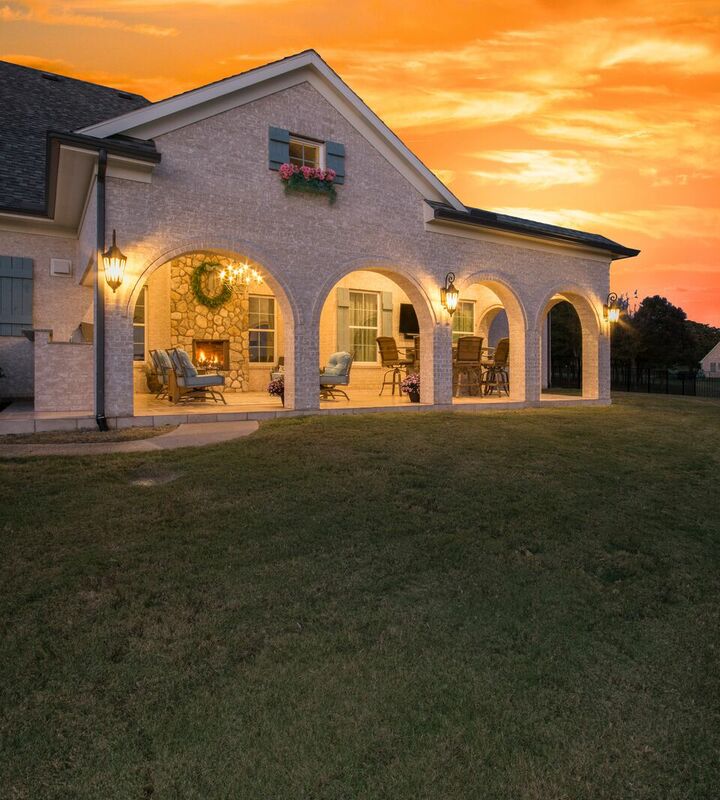 This home is located in an area of Houston that has a wide variety of styles of home. This 1929 bungalow only had a wooden deck in the backyard of a small lot. This homeowner had an existing covered area that was not quite big enough to fit their needs. The homeowner wanted a space to sit outside and watch local teams in their quest for greatness. The homeowner had an existing pergola and landscaping that didn’t give them the outdoor space they desired. This home had an existing small patio cover, paver patio with a knee wall and an existing pergola out in the yard. 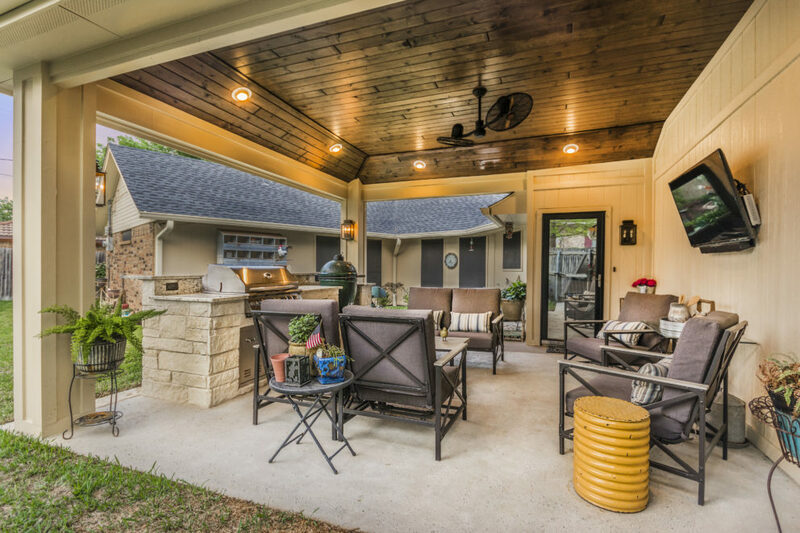 A great covered patio to enjoy the outdoors and spend quality time with family and friends. An American traditional Spring Valley home added a beautiful outdoor living room. This home needed some serious shade — a patio cover that runs almost the entire length of the home was added. The homeowner was struggling to find a solution to create an outdoor living area because of the existing roof lines and drainage issues that existed. This modern outdoor living room in the Memorial area of Houston provides the homeowner with 600 square feet of additional entertaining space at their home. This Spring Valley – Afton Village- outdoor living space was created off the side of the garage with a tie in to the back of the home as well. This Friendswood homeowner wanted to add a large covered living area off the back of their home. This Texas Hill Country style patio cover came about because the homeowner wanted to extend their current cover and add a small kitchen area. The homeowner wanted to build an outdoor living room that blended with the neighborhood’s strict guidelines per Historic District requirements in the Historic Heights area of Houston. This homeowner wanted to update their outdoor living space, so we gave them a California coastal vibe … complete with a complementary private lounge area. The homeowner wanted to add a covered space that had enough seating for a crowd to gather to watch some football! The homeowner had an existing outdoor kitchen and patio that was built original to the home. This Katy couple had an existing patio cover, but it really didn’t give them much for usable space. This patio cover and wood burning fireplace was added to the home. A patio cover was added to this 2 story home in Richmond in order to give the homeowner a nice outdoor space to entertain and to allow the kids to have a shaded area while playing. 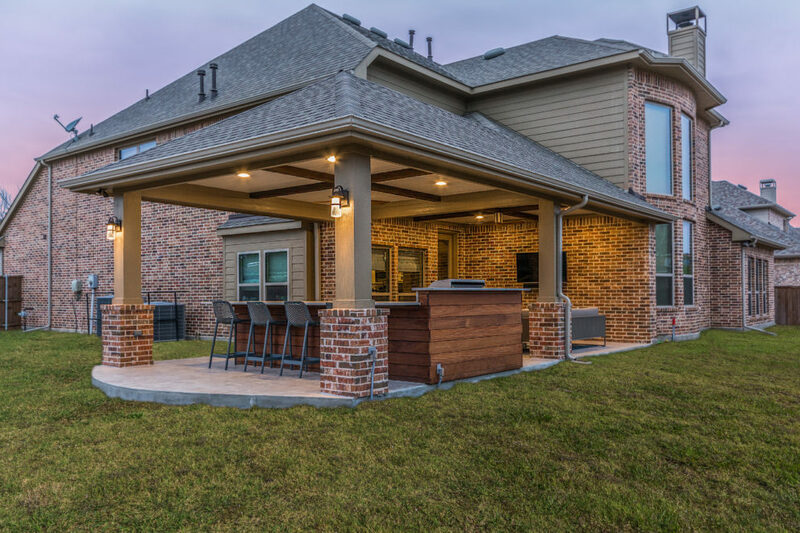 A patio cover was added to the back of this home in Little Elm (just outside of Dallas) to allow the homeowner to have an outdoor living area in which he could entertain family and friends. 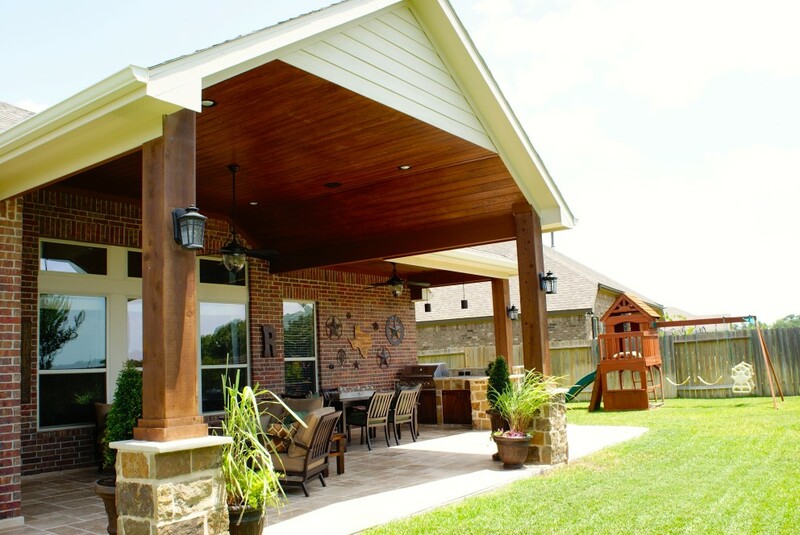 This Missouri City/SugarLand project replaced an inefficient pergola and deck in order to create a freestanding outdoor living space. A simple, yet elegant design makes for a great outdoor living space. Our homeowner wanted two distinct areas: a shady hangout under the patio cover, featuring a kitchen & bar; and an open-air fire pit with built-in seating. This patio cover in Lakes of Rosehill maximizes space by placing the summer kitchen completely outside the covered space. The limited space in this backyard dictated building the patio cover off the detached garage. The homeowner was looking to have a patio cover that would have space for an outdoor kitchen and a sitting area. Different roof heights and other obstacles created a design challenge for this patio cover in Colleyville. The challenge: to design a patio cover that looks like it belongs on the home with all of the different roof lines and elevations. With the existing pool already dominating the backyard, the design challenge was to create space to enjoy a fireplace, outdoor kitchen and dining under a roof structure. This shady retreat delivers great views of the golf course and space for entertaining, grilling and dining. A large travertine patio surface is just the beginning of this project. The stone work really stands out on this gable-style patio cover and outdoor kitchen where we replaced a window and siding with a smaller window and stone on the back of the home. Our client wanted to enhance the space around an existing pond by building a shady outdoor kitchen area adjacent. This home backs up to Terry Hershey Park. You don’t need a huge backyard to create a remarkable outdoor living room. A large backyard in Heritage Grand/Cinco Ranch provided a blank slate for our project developer to design a functional multi-purpose space. This project in Richmond takes advantage of the fact that the home is on acreage with a total space of 18′ x 41′ under cover and some additional patio space outside the cover. The best solution for this home was a two-story cover. This project makes great use of space in this Galleria-area backyard. This beautiful project in Telfair backs up to green space and is topped off by a nicely landscaped backyard. This room addition was built to serve in several capacities: an at home office, a pool house/game room, or a mother-in-law suite. 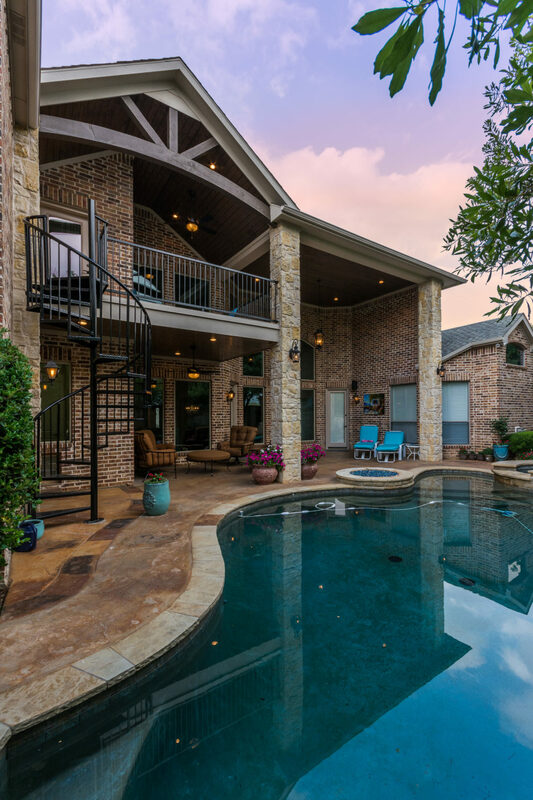 For this project in Cinco Ranch, the detached garage provided a perfect location to create an outdoor living room and kitchen in close proximity to the house and the pool despite the limitations on the back of the home. 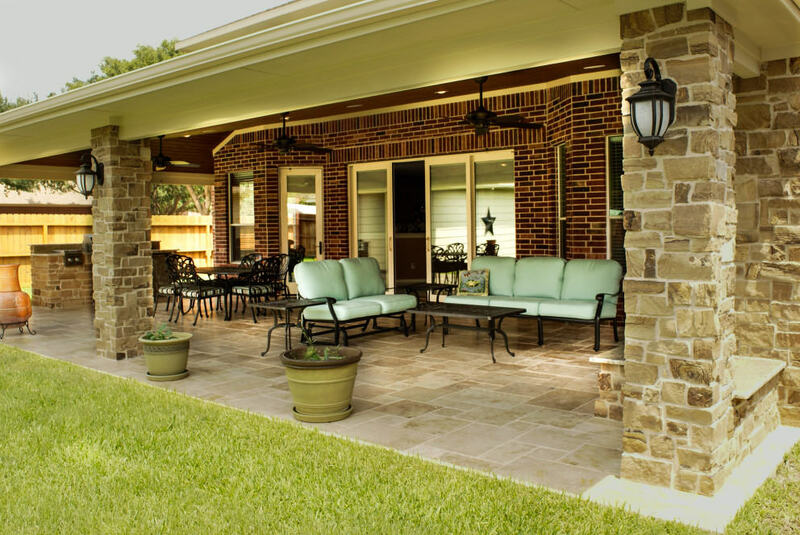 We are absolutely in love with the patio Texas Custom Patios built. Everyone was very professional and we have a beautiful place to enjoy the outdoors. Thanks!